Many of the kākahu on display in Te Papa’s Kahu Ora exhibition are contemporary works that serve as fantastic examples of the vitality of raranga as an art form. During preparation of the items for display, as we dressed them on mannequins and cloak forms, we had the special opportunity to work with one of the artists represented in the exhibition, Kohai Grace (she has also been in the Weaver’s Studio, see post below). The ensemble that Kohai has lent us is woven in beautiful pale undyed muka and consists of a short strapless tunic style dress and cape, decorated with albatross feathers. When the tunic and cape arrived in the conservation lab for assessment, I found a pointed shell pin inside the box as well. We didn’t have any photographs that showed how the pin would have been used with the garments, so I wasn’t sure if it was meant to fasten the cloak, or for some other purpose. I also noticed that one of the loops along the back opening of the dress had come unstitched, so a very minor repair would have to be done to enable the dress to be laced up the back properly. Knowing that Kohai was within an hour’s drive of Wellington, I asked Curator Awhina Tamarapa to get in touch with Kohai to ask whether she would like to come in to help prepare her garment for exhibition. Object Support Mountmaker Penny Angrick and I had previously worked out the way we thought the cape might be displayed with the dress, but we learned from Kohai that she preferred more of the front of the dress to be visible to the viewer. 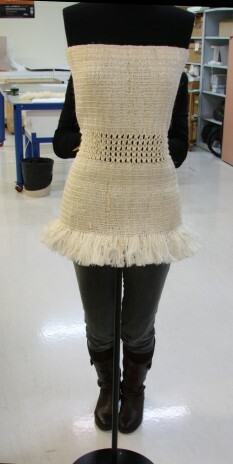 Kohai stitched down the wayward loop at the back of the dress and showed us the intended position of the shell pin. It was nice to share the decision-making about display and presentation with Kohai, and to carry out our work in the true spirit of “Living Cloaks”. He tino aatahua to mahi e hoa pai rawa atu, ka mau te we he.